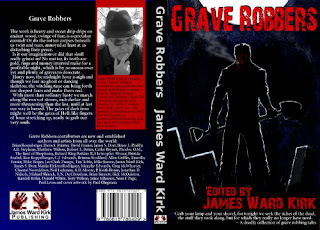 In the anthology Grave Robbers, edited by James Ward Kirk (James Ward Kirk Publications, 2013), forty-two authors in poetry, flash, and short fiction explore the gruesome exploits of those unholy trespassers who would disturb the peace of the dead. Besides raiders plundering tombs for gold and jewels, we find Resurrectionists in the tradition of Burke and Hare, pranksters, identity thieves, soul stealers, revenge seekers, body dumpers, cannibals, grieving lovers, demon worshippers, ghouls, musicians using body parts to play their tunes, practitioners of the Dark Arts, old and new vampires, and those who awaken the dead to hear their stories. A surprising number are children…. 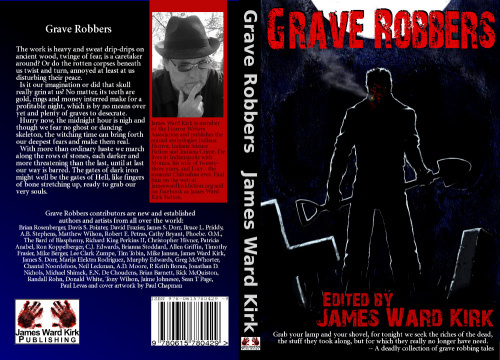 The “Grave Digger’s Survival Guide,” provided to C. J. Edwards anonymously, provides good advice for the aspiring looter and one can imagine a thief singing A. B. Stephens’s “Grave Robbers Chant” while he’s hard at work. A memorable chorus adds creepiness to Bruce L. Priddy’s “No Rest in Arkham Graves.” Several poems pack a short story in just a few lines, notably Brian Rosenberger’s “A Prayer to the Saint of Broken Dreams,” Robert E. Petras’s “Identity Theft,” and Mathew Wilson’s “The Keeper.” Christopher Hivner’s “The Owners of the Bones” is particularly suspenseful for verse. In the short-story section, Murphy Edwards’s “Ace of Spades” and Michael Shimek’s “Reclaiming Property” are absolutely delightful. The former is an entertaining tale from a veteran story-teller and the latter is a very appealing entry from an emerging writer. Mike Jansen’s “The Arrangement” is fun, too. The period pieces are well done. Greg McWhorter brings a vivid sense of Victorian Westchester, New York to “Glint of Evil.” His matter-of-fact journalistic style lends a definite spookiness besides veracity to the story. There is “odd heathen business” afoot in the English marshland of 1837 in Sean T. Page’s atmospheric “The Marsh People.” Chantal Noordeloos’s “Angel’s Grave” about 1892 desecrators is as believable as any real ghost tale. She also builds a marvelous feeling of dread in “…fit for a King,” a beautiful story that exhibits creepy expertise in the tomb raiding profession. Editor Kirk does not neglect the more poignant side of death. A grieving father follows an unexplained walkway in James S. Dorr’s moving “The Sidewalk.” Neil Leckman explores paternal loss in “My Hands” and P. Keith Boran delivers a horror story with romantic elements in “Some People,” as does Jaime Johnesee. Her “Old Man Death” has a sweet twist. The most unsettling stories concern teen angst. A tormented young man wishes he was dead in Randall Rohn’s unusual “Unanswered Prayers.” The anguish in Paul Levas’s “Richie’s Night Out At the Hills Cemetery” is real and the boy’s relationship with his grandmother is heartbreaking. The final image of editor Kirk’s “Synesthete” is beautiful and haunting. In Marija Elektra Rodriguez’s “Sotterraneo,” a Domina leads a gruesome ritual that will reveal those worthy of immortality. It is as fascinating and suspenseful as A. D. Moore’s “Just Desserts” is nicely gross. Timothy Frasier’s “Necrofreaks” and Donald White’s “Temple of the Life Givers” are not recommended for anyone under 21--or the faint of heart. Still, you would be surprised at the number of corpses angry that the living would disturb their rest and exact sweet revenge for such desecration. Some will eat the perpetrator or turn him into a vampire; others will “merely” trade places with him. As James S. Dorr asks in his splendid poem “The Resurrection Man,” “An’ wha’s tae save ye once ye’re planted ‘neath the ground?” Indeed. Cemetery photos by Mike Jansen separate the sections of twenty-six poems, thirteen flash, and twenty-four short stories. The “Poems” section photo of two worn stones leaning toward each other is quite poignant. If the spooky cover illustration by Paul Chapman is not warning enough, the creepy foreword by contributor Jansen cautions, “be dead when they bury you.” Given the nefarious business going on under our feet, good advice.